Traditional corner stores in general have been almost extinguished from the streets of Munich, surviving almost exclusively in the form of immigrant grocery stores which unfortunately only on extremely rare occasions stock organic items. However, there are a few survivers from the time when organic was an unknown word in supermarket chains: small supermarkets equipped with wooden shelfs and as crammed to the brim as possible for orderly German souls. Usually they have everything on offer needed for your daily life, and just give you fewer choice between brands. Sometimes you'll find delicatessen the big players don't stock, and fresh produce with few exceptions is as fresh as from their competitors. Prices may be a few cents higher than the cheapest option in one of the retail chains, but you may be surprised to learn that many products actually are less expensive in the corne shop. In addition you may have a chat with the shop owners and usually will be given a competent answer to questions you may have. Many of these shops have some tables and chairs where you can have a coffee, snack or vegetarian lunch. 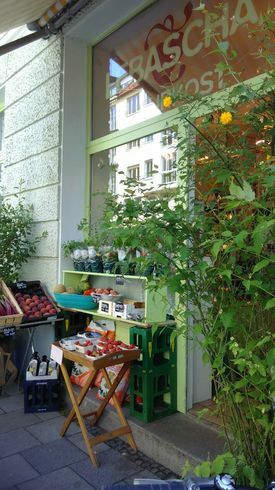 Munich's oldest existing organic supermarket is the Kornkammer in Schwabing, just a minute away from Münchner Freiheit. It's located on two storeys, and you can comfortably sit upstairs with your coffee or smoothie, browsing your smartphone or reading a book. Unfortunately they stopped to serve lunch, but you can still have a piece of cake or a prefab organic spring roll. The range of goods available from the shop is a wild mixture of groceries, body care, bare foot shoes, esoteric articles and more. Mind you: If you happen to take the wrong street you might end up in front of the Denn's supermarket branch in Feilitzschstraße 7-9 -- Kornkammer is located on the next parallel street further north. In Maxvorstadt, the vibrant university neighbourhood, you'll find Mutter Erde ("Mother Earth"), a crowded place during lunch time when you can have a simple vegan home-cooked meal, tea and coffee. On working days they serve lunch from 12 o'clock (as long as available), on Saturdays between 11 am and 1 pm. If you find the place too crowded step by the zero-waste grocery Ohne where fully organic lunch is being served from 12 o'clock. Note that Mother Earth no longer is a full retailer: Some time ago they exchanged their body care and cosmetics shelves with a table and bench to sit down with your meal. A real full retail neighbourhood shop in Haidhausen is Lebascha run collectively by a bunch of friendly women. You will often find them in a brief chat with customers from the neighbourhood, and they will happily serve you coffee drinks and a delicious cake. During the warm season you can sit outside and relax in a relatively quiet street with beautiful houses. They don't have a freezer, but make up for it with arguably the biggest selection of liquorice in town (though only a few of them are organic). You can bring along your own glasses and boxes in order to buy liquorice, cheese, antipasti and cakes or borrow Lebascha's returnable jars for a small deposit. A few corners away from tube stop Implerstraße in Sendling the neighbourhood grocery Hollerbusch ("elderbush") offers vegan and vegetarian lunch as well as yoga, pilates or singing lessons in a backroom. 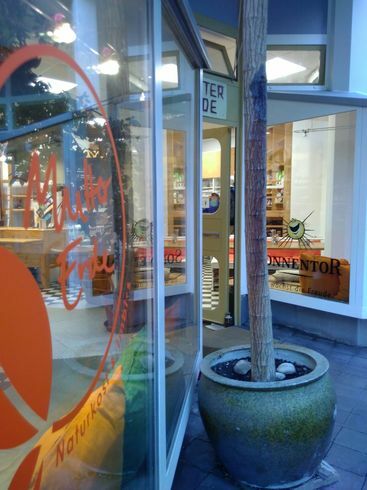 The shop is also a delivery hub for the Munich based community supported agriculture project Kartoffelkombinat. While these small supermarkets cater for all daily necessities including fresh fruits and veges there's no such thing as an all-organic immigrant grocery focussing on the latter and supplementing with a selection of dry goods and delicatessen from their owner's place of birth. The nearest you come is Giesinger Fruchtmarkt near tube-stop Kolumbusplatz. Since about three quarters of the fruits and veges as well as most of the Italian delicatessen are conventional you have to carefully watch out for the bio keyword. Apart from organic greens they also offer organic choices for olive oil, wine, pasta and cheese. Specializing in cheese and supplements -- wine, olives, oil, herbs, condiments, to name a few -- the Luigino's booth in the Southern part of Viktualienmarkt, opposite the crossing of Reichenbachstraße and Blumenstraße is the perfect place to shop for a picknick or the no-frills romantic candle light dinner. Once an almost entirely organic cheese booth the percentage of organic products on sale has diminished during the past years: mainly due to the advent of artisanal, yet conventional Italian cured meats, partially due to a lesser focus on organic labels on the selection of cheeses. When ordering an Italian-style sandwich to take away you may wish to enquire about the ingredients and probably stick to the vegetarian ones since the Italian cured meat products usually are not organic. The owner once run a delicatessen in Maxvorstand which was replaced by an organic ice-cream parlour in 2018. 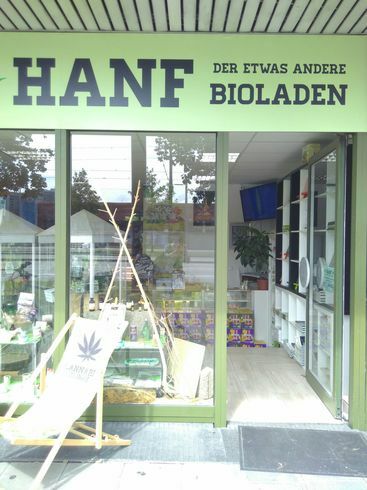 A very special mono-themed convenience store, Hanf -- der etwas andere Bioladen, sells everything containing THC-free hemp: beer, lemonades, cookies, bars, tea, ice-cream, chocolates, body care, clothes, liquids, pet food and more. Although the name suggests it not all products are certified organic, especially not in the non-food range, but the sheer number of goods based on this versatile plant is quite impressive. The main shop (which is closed on Mondays) isn't located in the most inviting part of town but can easily be reached from Leuchtenbergring urban train stop. But wait: in 2019 a second one opened at a tourist-friendly location between Isartor and Marienplatz. This work by trish is licensed under a Creative Commons Attribution-NonCommercial-ShareAlike 4.0 International License. For commercial use contact the author.